Hello and welcome to another Peachy Keen Stamps Sneak Peek!! Woohoo!! There's new stamps a comin', and oh, my goodness, are they ever awesome!!!! Here's a little sneak peek of a project I've been working on with my new PKS stamps. There's several days worth of sneak peeks ahead, and the big blog hop and reveal on Thursday. 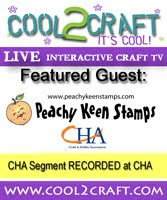 Check out the blogs of Viv, Heidi and Kim for some more peeks at all the wonderfulness headed your happy stamping way!! Can't wait to see the rest of your project!! I'm with you on Dexter!! Something has got to fill the space until next season of True Blood!! oh, Lorie, you little sneek looks simply spooooky!! I can't wait to see the rest of it!! Ooh, I'm loving it. Can't wait to see the whole thing. cant wait to see the whole creation!! !